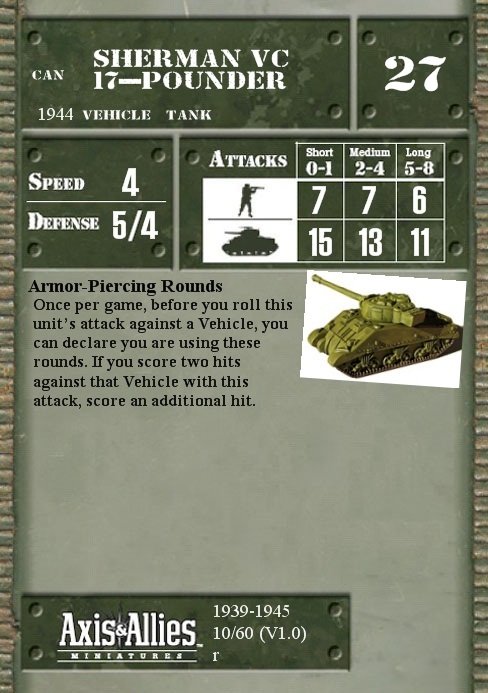 Once per game, before you roll this unit’s attack against a Vehicle, you can declare you are using these rounds. If you score two hits against that Vehicle with this attack, score an additional hit. Once per game, before you roll this unit's attack against a Vehicle, you can declare you are using these rounds. If you score two hits against that Vehicle with this attack, score an additional hit. Q: What happens if a Sherman Easy Eight announces the use of an Armored Piercing Round and fires upon a vehicle with Heavy Armor? How do you get damaged or destroy results? A: If an AP round scores two hits, it automatically gets a 'free' third hit. If this happens against a tank with the Heavy Armor SA, then the tank takes all three hits. But the Heavy Armor SA cancels the second one, so the ultimate effect is that the tank suffers only two hits, not three. If the Easy 8 scores enough successes to get three hits from a single attack, then the AP round has no additional effect. The text of that special ability stipulates that the bonus hit applies if the attack scores two hits. You can never score more than three hits against a single target in a single attack.